Kim Kenward, instructional designer, and Justin Melick, digital media developer, in eLearning and Emerging Technologies presented with Dr. Rosemary Cleveland, COE Faculty, presented at the 7th annual virtual conference for the Pennsylvania State System of Higher Education (PASSHE). The session was held on Monday, February 15 at 11am EST via Blackboard Collaborate and their session topic was “Moving Student Presentations Online” and there were over 30 attendees from across the nation. Abstract: Our conference presentation will help faculty and instructional designers identify technology resources and assignment design considerations for supporting online student presentations. This session will also provide information on the role of student project partners to facilitate student engagement opportunities for peer review, feedback and building online community. Kim Kenward has worked as an instructional designer for over eighteen years. She has taught and developed several online/hybrid educational technology courses, as well as worked as the Instruction Librarian and Library Director at various institutions. Kim is actively involved in the GVSU College of Education teacher preparation programs, specifically in the area of integrating technology into teaching and learning. Justin Melick is a Digital Media Developer at Grand Valley where he works with faculty to create a variety of digital content for their courses. He specifically works with faculty to increase instructor presence in their online and hybrid courses and is responsible for building and pioneering the use of GVSU’s Lightboard. Dr. Rosemary Cleveland has been a faculty member in the GVSU College of Education for fourteen years. Previous to that, she was a school administrator and a teacher for thirty-one years. Rosemary teaches in the graduate teacher certification program in both the online and in-seat format. She is passionate about teacher leadership and curriculum development. Get started with building community in your class on day one. Here, Dr. Cleveland begins her courses with having students create an “about me” slide in Powerpoint. Attendees in the session shared a variety of ideas of assessment activities for students, ranging from using the discussion boards and peer review tools in the LMS, to ApprenNet, to Voicethread. Screencast-O-Matic is a great tool for students to use to record the screen and share their video assessments. For more information, please check out the presentation slides on Slideshare! 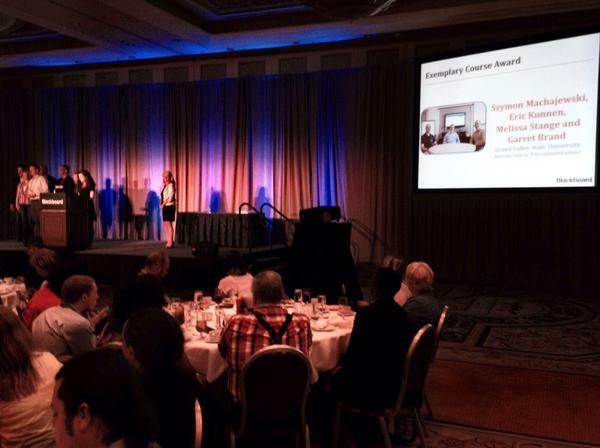 Each year, EDUCAUSE researches the trends impacting education through technology – and the role that technology plays in advancing teaching and learning in a “Top 10 IT Issues” list. With a wealth of technological resources we have at our finger tips, staying up to speed can be a challenge. Our focus in eLearning and Emerging Technologies is to not only help to provide access to technology but to assist faculty in adopting technology tools that can help to enhance teaching and learning – to solve instructional problems and with the ultimate goal of improving student success and retention. Optimizing Educational Technology is what eLearning and Emerging Technologies at GVSU is all about! As shown in the chart above, the top 2 technologies in which the highest percentage of faculty desire more training are: “Online Collaboration Tools” at 61% and the “LMS” (Blackboard) at 60%. Along these lines, the eLearning staff provides a wide array of training through seminars offered in GVSU’s Sprout system. The eLearning team also offers individual consultations to help support faculty. In fact, a list of upcoming workshops can be found on our website. In addition, please reach out us if we can provide assistance to you! As indicated in the survey results, the LMS (Blackboard) continues to be an important resource for faculty and students. In fact, when students were surveyed as part of the ECAR study at GVSU, 94% indicated that Blackboard was used in at least one of their courses, with 54% reporting that all of their classes used an LMS. Looking for a way to create some interest and engagement in your course? Digital resources through PBS LearningMedia provides “Infinite Inspiration for your Classroom”… In this post, Kim Kenward, Instructional Designer in IDeL, highlights GVSU’s work with WGVU and PBS LearningMedia. Did you know that GVSU is currently ranked sixth in the entire nation for most usage and “hits” on PBS Learning Media? Based on usage by faculty and students, our use of the video resources has been recognized by PBS! If you haven’t explored this amazing online resource, this innovative tool provides an amazing wealth of “free” media resources, thousands of innovative, standards-aligned digital resources, and professional development opportunities. In addition, if you would like more information, you contact Mike Fillman (fillmanm@gvsu.edu), WGVU Education Coordinator, with any questions, trainings or assistance you may need with using PBS LearningMedia. Look for Mike Fillman at our 15th Annual Teaching & Learning with Technology Symposium that will be held on Wednesday, March 23, 2016 in the Mary Idema Pew Library Learning and Information Commons. In a special session organized by Kim Kenward, instructional designer in IDeL, faculty and staff at GVSU learned about a new resources available via a special partnership with PBS. Faculty and students can access thousands of FREE, standards-aligned digital resources that can be used for classroom and online courses. With 100k+ digital resources from a variety of subjects, faculty can integrate the content into their curriculum to help their students make connections to a variety of topics. Developed in partnership with the WGBH Educational Foundation and supported by public media stations nationwide, PBS LearningMedia offers multiple service levels to millions of educators and students. In July, Rosemary Cleveland, GVSU COE proferssor and graduate teacher certification students were filmed by WGVU regarding their training and use of PBS Learning Media. This video is currently on the WGVU Home Page and is airing multiple times on WGVU HD from now until October 30. Learn more about PBS LearningMedia and create your account by visiting: http://pbslearningmedia.org You can also follow PBS LearningMedia on Twitter and Facebook. TPACK is a framework that helps to zero in on the interplay between technology, pedagogy, and content. In thinking about including the use of a LMS into teaching and into the classroom, this model can help to connect what may seem like separate and distinct areas of teaching practice into a synergistic view of integration. 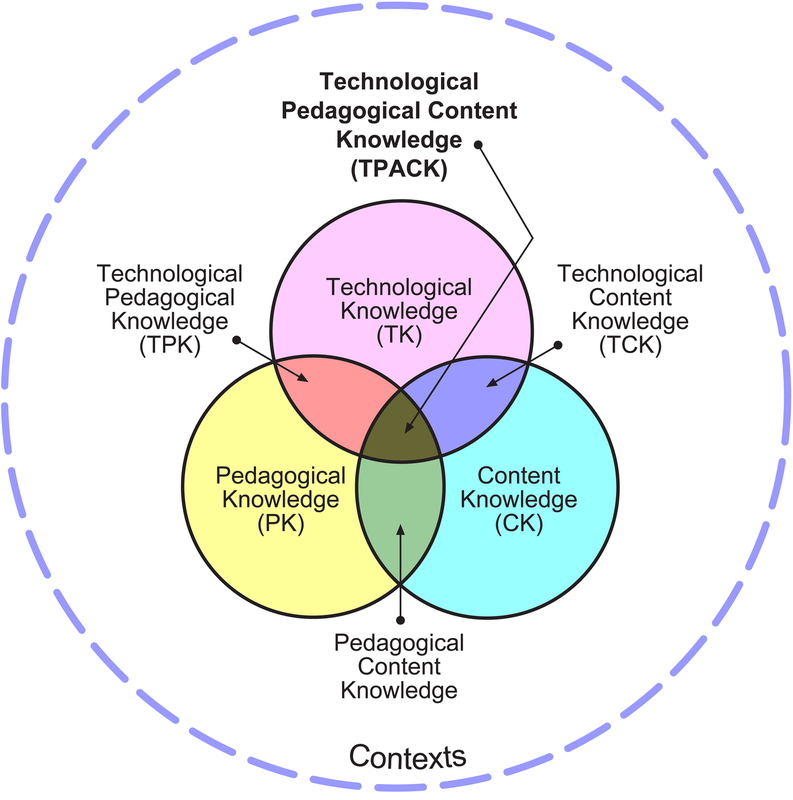 What I like about TPACK is that it zeros in on the intersection and interplay of the domains of: Content, Pedagogy, and Technology. This model can be used to be reflective and yet intentional when viewed from the aspect of teaching practice and instructional technology deployment. This can be useful for faculty, instructional designers, those involved in designing professional development activities, and instructional technologists. Using the TPACK model, faculty and instructional designers can focus on relaying content that adhere to course outcomes in a way that is pedagogically effective through the application of appropriate technologies. Taken together this truly has potential to transform teaching and learning. This in turn, has direct implications for faculty professional development as well as instructional technologists that are charged with providing support for technology integration in teaching. While the focus is on the TPACK “center”, the following intersections may be helpful to review to begin putting TPACK into practice and it is also where the “rubber-meets-the-road” so to speak. This intersection is all about how technology can be applied to subject matter to represent it and formulate it in ways never before possible – with the goal to make it comprehensible for diverse populate learners and learning styles. Blackboard can power unique applications and representations of content. Powerful analogies through Blackboard Collaborate Voice Tools or VoiceThread, illustrations through Slideshare and Flickr Mashups, examples and simulations or explanations throughYouTube Mashups, and demonstrations or real world application of content with engaging video tools such as NBC Learn can be easily added to courses in Blackboard. This intersection relates to how subject matter can be organized, adapted, facilitated, and presented. Blackboard enables faculty and instructional designers to create an effective sequence and structure in displaying course materials, assignments, and learning activities. Learning Units, Lesson Plans, Course Links, and Tool Links can be used by faculty to bring about custom course designs in Blackboard. In addition, Adaptive Release can be leveraged to create custom learner paths. This intersection is about the knowledge of the existence of technologies and the ability to apply them to transform teaching and learning. Blackboard has a wide array of tools for teaching. These tools can be broken down into Content Delivery, Communication, and Assessment categories. There are also features that provide the ability to manage and maintain class records. A few of the features in Blackboard include: Grade Center, Discussion Boards, Wikis, Blogs, Journals, Assignments, SafeAssignments, content Mashups (Slideshare, Flickr, YouTube, Camtasia Relay, NBC video content,Voice Authoring), Email, Instant Messaging, Voice Boards, Voice Email, Voice Announcements, Self and Peer Assessment, Surveys, Tests, Group Tools, Announcements, etc. Which domain do you naturally fall into? What domain do you need to spend some more time on and learn about? What steps can you take to approach “the center”? 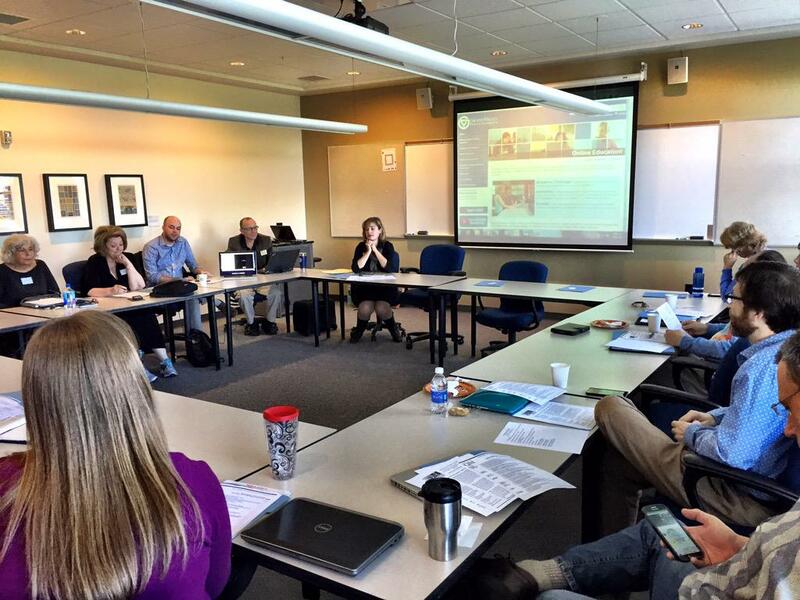 How can the eLearning and Emerging Technologies team at GVSU support you?